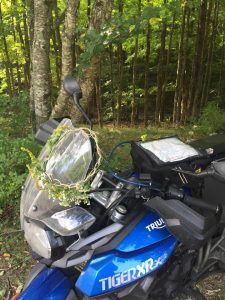 Sunday evening marked my return from seven glorious weeks on the road mostly through Western Canada with Trudy, my trusty Triumph Tiger, stopping just shy of the Pacific Ocean. Six of those weeks were on the Ancestor Trail, following the migration of my grandparents after they arrived in Canada in the mid-1920’s. Last week I completed the final course in the Four Winds Energy Medicine program at Menla Mountain Retreat, a magical place in the Catskills of New York—the perfect place to begin assimilating what I heard, saw, learned, felt, and understood. I’m not ready to convey my experiences yet—my thoughts simply aren’t that organized. Stories will filter out over the coming months. I can tell you the Ancestor Trail was an extraordinary journey through time and space that took me to physical and spiritual places I hadn’t imagined. Walking the land my grandparents lived on, trying to put myself in their shoes as best I could, and imagining what life was like for them was a singular experience. There’s no question in my mind they were with me in spirit the whole way. I visualized the four of them sitting behind me on the bike, laughing, chatting, sometimes somber, pointing out things for me to see. They were as excited to be on this journey as I was and eager for me to remember and honor their lives. Roads and rail lines run side by side across the prairies—the same rails that carried the trains that took them from where they disembarked from their respective steamers in Halifax and Quebec City, into the unknown. As I rode for endless miles along those tracks, stories my grandfather told me came to life. The same thing happened in places they’d lived. Strangers whose families had shared their path, grandchildren of the families who’d given them refuge, bonded like instant family; like we’d known each other forever. Even those outside the cultural core I was exploring—archivists, small town residents, farmers, wait staff, friends I met through social networking—anyone I approached to ask questions or pursue a potential connection—went out of their way to help. Meeting with kin resonated as never before. I hadn’t appreciated the strength of blood until visiting cousins from my parents’ generation. It didn’t matter that they were in their 90’s and we hadn’t been together for decades. Age, time, and space were arbitrary with these heart connections. The power of reconnecting with roots through cultural delicacies like borscht, zweibach (buns), and werenike (dumplings), and sausage caught me off guard. I can’t say I learned any new physical facts about my ancestors, but I got to appreciate them more deeply and know them at a whole new soul level. And that’s what this trip was all about—understanding their thoughts, experiences, and beliefs so I can recognize how they live through me. Processing that is going to take some time. Even before I crashed in 2014 on my first attempt at this quest, I was quickly coming to the realization I wasn’t ready spiritually to take it on. It was apparent in my planning, lack of cultural research, and casual approach to the trip. This summer, there was no question it was time. Here in the northern hemisphere, we’ve just crossed the autumn equinox, into six months with more darkness than light. If summer was the time to travel, autumn and winter are the time to hibernate, explore the dark corners, and write. I have no idea where my heart will lead my pen. But only by allowing it full expression will I understand the wisdom of my ancestors and how it’s embodied in me. I look forward to reading to your ‘hiber-writing’. A very eloquent post. Nice play on words Bill. 🙂 Thanks. Liz, once again your words are an inspiration to my own life. Thanks for sharing and thank you even more for having a courageous spirit to follow this path. Liz I am looking forward to what your heart and mind bring to your pen. Looking forward to reading about your experiences. You certainly have a beautiful way of conveying your thoughts. Hopefully you will have a mojo article in the works. Thanks Norm. More MOJO articles in the works!